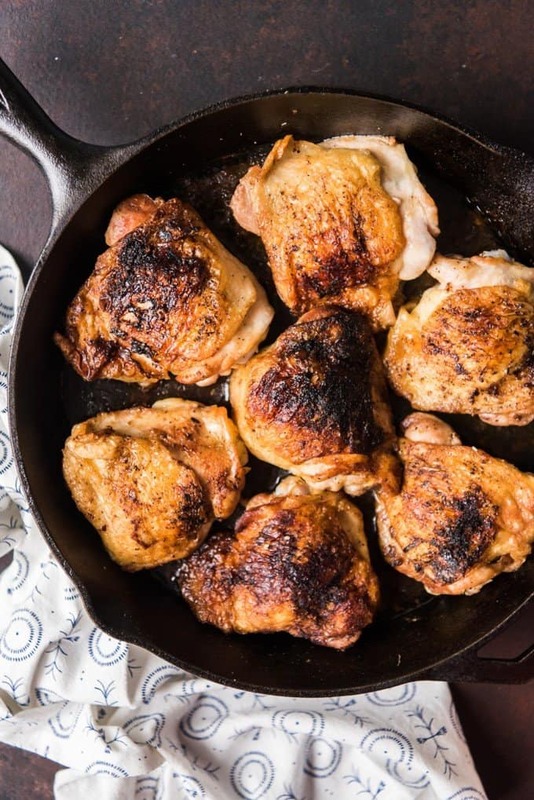 Crispy Cast Iron Skillet Chicken Thighs are always a hit with the family and are a mostly hands-off dinner that is ready in less than 30 minutes! 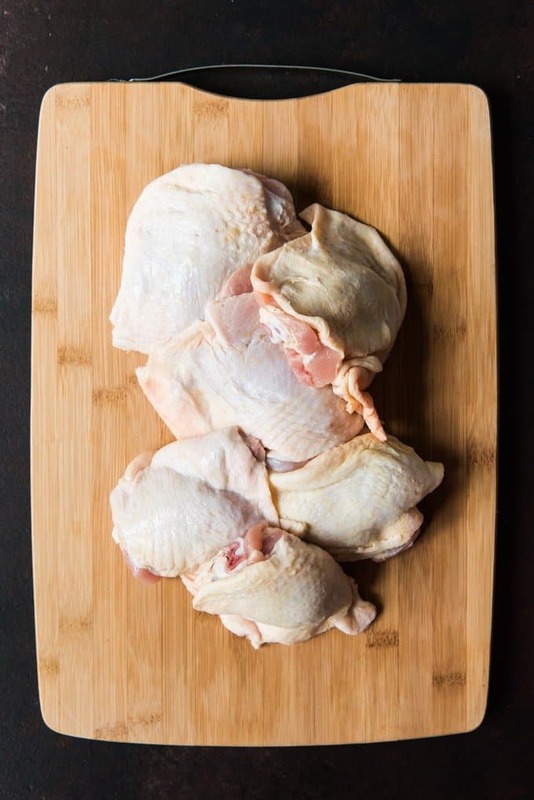 Better for you than classic fried chicken but still with delicious crispy skin and moist, tender meat that your family will love and that pairs perfectly almost any side! Today I’ve got another healthier recipe that I know you are going to love! I’m joining forces with my friend Kathy over at Lemon Blossoms again as we share some of our favorite delicious and healthy meals for the New Year! 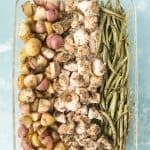 Just look at her scrumptious and flavor packed Sheet Pan Chicken and Vegetables Stir Fry that is a full meal made in one pan! It’s got an easy, homemade sauce and you can customize it with whatever veggies you have on hand. 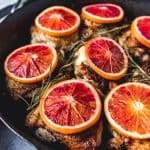 But let’s talk these crispy cast iron skillet chicken thighs that just happen to be Whole 30 compliant but are every bit as satisfying as fried chicken in my opinion. First though, a confession: I used to not like chicken thighs. I don’t really know why but I think I thought they were too greasy or I didn’t like the flavor of dark meat or whatever. But for ages the only cut of chicken I would make were chicken breasts! Until I tried Our Best Bite’s spicy honey chicken recipe, which called for boneless skinless chicken thighs rather than breasts. And I couldn’t get over how delicious they were! It’s still one of our favorite chicken recipes and a go-to dinner for us. Those spicy honey chicken thighs are what finally convinced me to leave my prejudice against thighs behind me. And it’s a good thing because these crackling, crispy cast iron chicken thighs are my other favorite way to prepare that particular cut of meat. 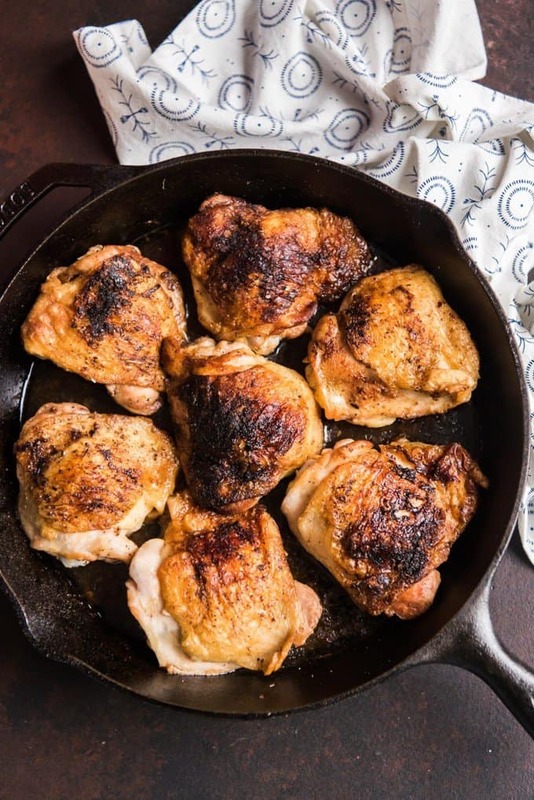 Except in this recipe you will use bone-in, skin-on chicken thighs and a good cast iron pan. I love cooking meat with the bone in because it keeps it so juicy and moist and adds so much flavor! 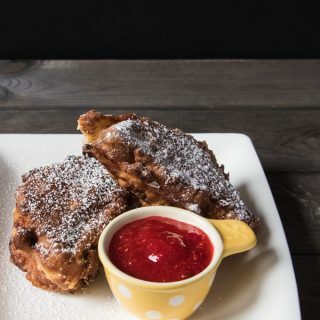 This recipe is really as much about technique as it is about ingredients, which are minimal. Other than a super simple seasoning of salt, pepper, and a little bit of garlic powder, there isn’t much else to the prep work for these chicken thighs. 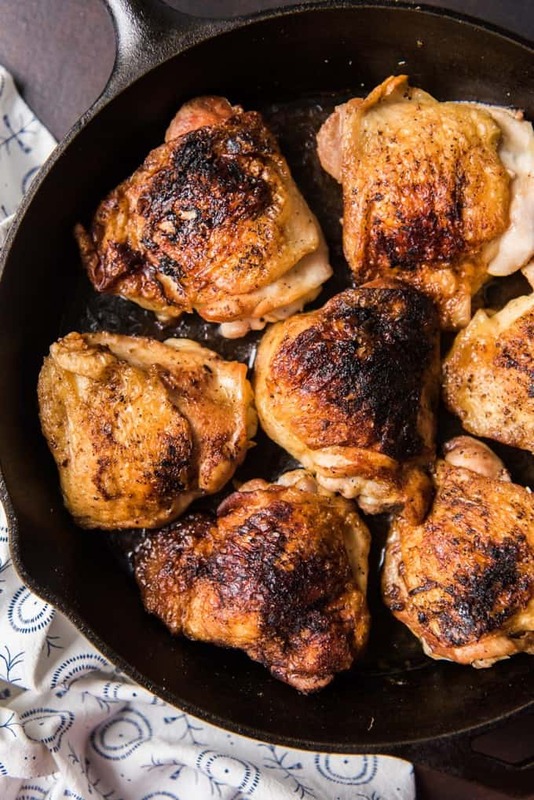 To make them, you first want to heat up your oven because after an initial sear skin-side down in a hot cast iron pan with just a tiny bit of oil, the chicken will get finished off by roasting in the oven until cooked through. 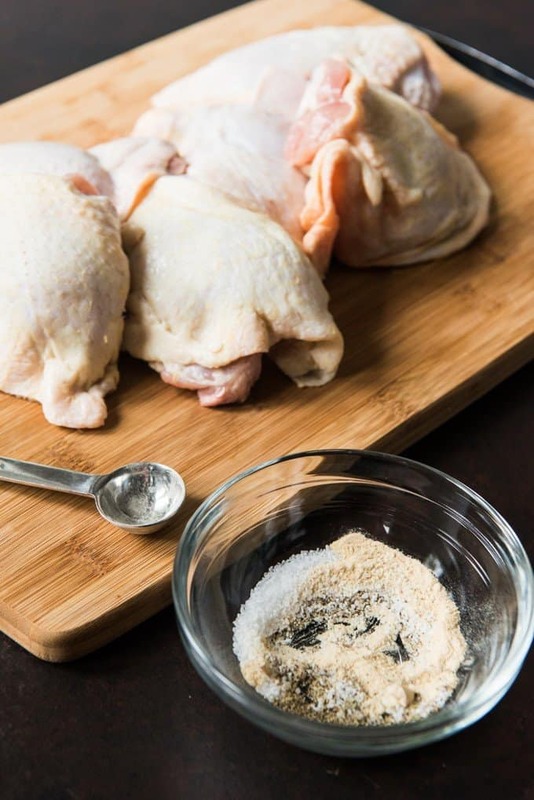 While the oven heats, mix together the salt, pepper, and garlic powder and sprinkle it evenly over both sides of the chicken thighs. Then heat up your cast iron pan nice and hot over medium-high heat and add a tablespoon or two of olive oil to it. I actually have two cast iron pans and will double the recipe just so I have plenty for leftovers as well! The chicken goes in skin-side down and then you need to just leave it alone so the hot cast iron pan can do it’s magic. 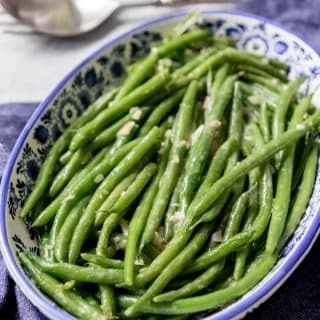 I first saw this technique on Stupid Easy Paleo back when I was doing my first Whole 30 and immediately fell in love. I mean, it takes all of 1 whole minute to season the chicken, and stick it in the pan, then the rest of the cooking process is just flipping the chicken once and sticking the pan in the oven. No babysitting dinner means I have time to make a side, set the table, or read a book to my girls while the food finishes cooking. In addition to not liking chicken thighs, I also used to not like chicken skin. But that’s because I had only ever had it with breaded, fried chicken from a certain fast food place that I’m not a particular fan of. It was greasy and heavy and breaded and I just found it blechy. But man oh man, the skin on these pan fried chicken thighs is something else entirely. Once they have seared for about 7 minutes or so, a wonderful crust forms and the skin is just full of flavor and crispy goodness. My girls rave about it and it’s always the first thing they go for when it’s time to eat. One word of caution: because you are rendering the fat from the chicken skin, it is going to create quite a bit of splatter. A splatterguard really comes in handy to keep cleanup to a minimum later. Also, you’re going to want to make sure to have your vent hood fan on. 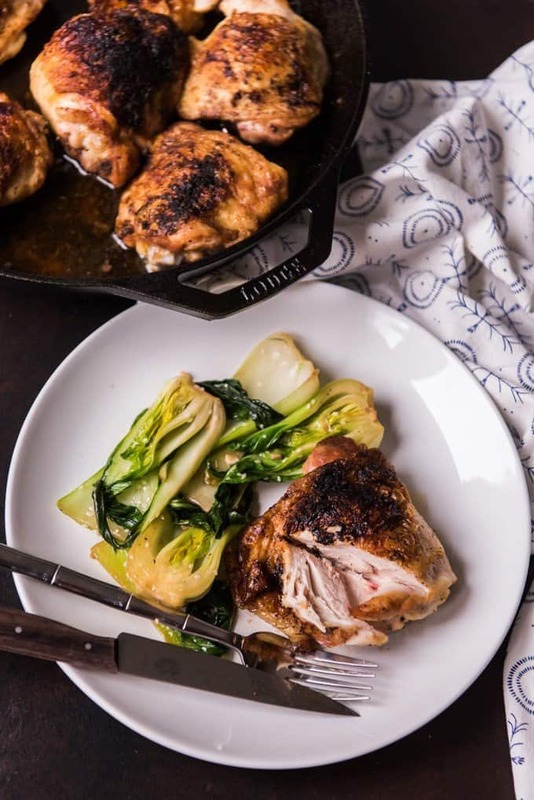 Serve these pan fried chicken thighs with some stir-fried baby bok choy or green beans and cauliflower rice and you’ve got an easy Whole 30 compliant dinner! 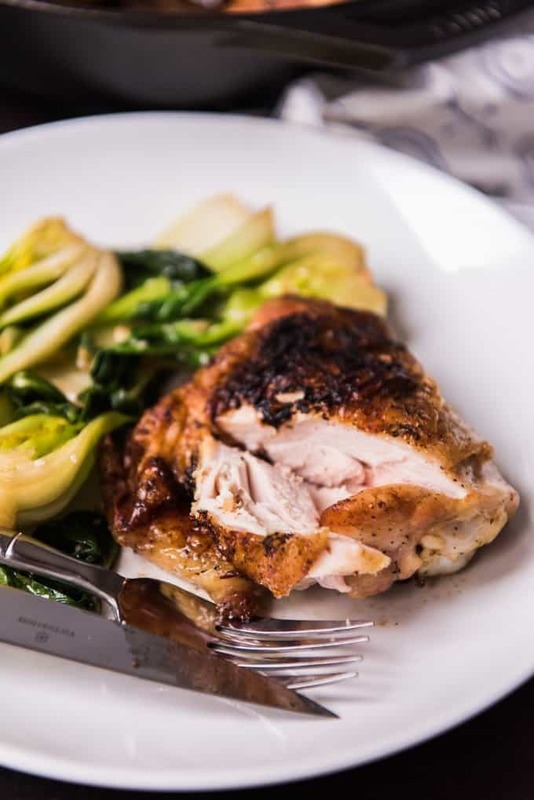 And if you aren’t doing Whole 30, go ahead and serve these chicken thighs with mashed potatoes or a wild rice pilaf! 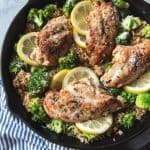 Be sure to check out Lemon Blossoms fantastically easy and health Sheet Pan Chicken and Vegetables Stir Fry as well! Pat the chicken thighs dry with paper towel. In a small bowl, combine the salt, garlic powder, and pepper, then sprinkle over the meat on both sides. In a cast-iron skillet, heat 1 to 2 tablespoons of olive oil over medium-high heat until hot. Place chicken thighs into the pan, skin side down and cover with a splatterguard. Cook without moving for 7-9 minutes so that the fat can render and the skin can get nice and crispy. Once the chicken releases from the pan and has a nicely browned crust on the skin, flip the chicken pieces over using tongs. 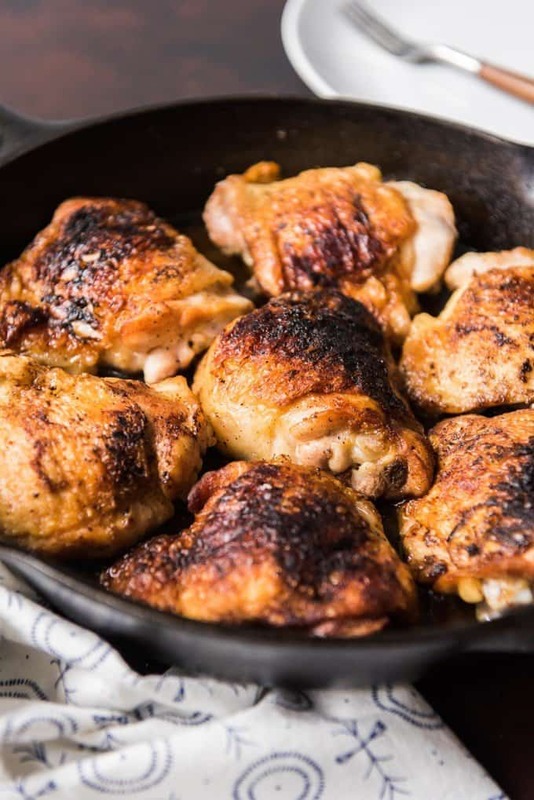 Transfer the skillet with the chicken to the oven and roast for 18-20 minutes until cooked through and the internal temperature of the chicken reaches 165 degrees F when tested with an instant read meat thermometer. 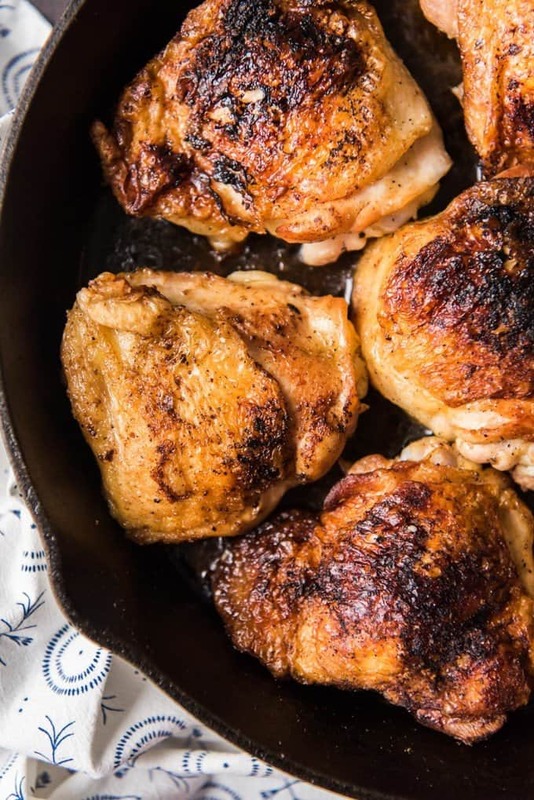 Because chicken thighs can vary pretty significantly in size, you may need to adjust cooking times in the oven for larger or smaller thighs. Adapted from Stupid Easy Paleo. Those thighs look amazing! They look so juicy. Iron skillets are a marvel! Wow! Such a gorgeous color on that chicken! I love your tip about keeping a splatter guard handy. I often figure that out way too late and make a bit of a mess. That looks so tender and juicy and the perfect easy weeknight dinner! I love a good chicken recipe and if it’s crisp on the outside I’m in heaven. Love the flavors you have going here. Cast iron sure makes a good crisp chicken. Yum! I love a good chicken dish! This one is just that! 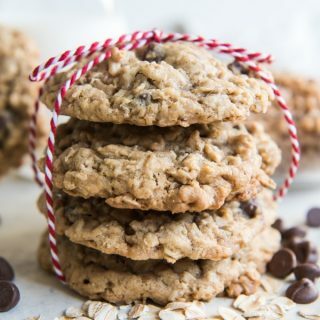 Made these last week and oh-my-word they were so, so good! I’m so glad you liked them! 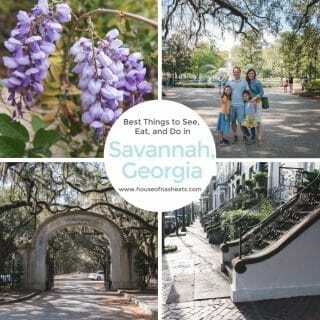 We make this alllll the time now! Super easy and delicious. Making again tonight! 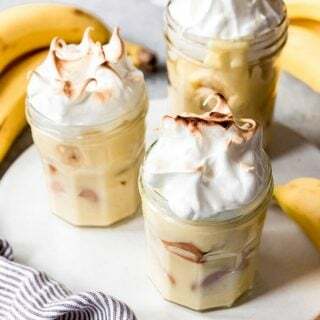 Made these last night and they were amazing!! Usually my husband grills thighs to get crispy skin, but this was just as good with none of the work! 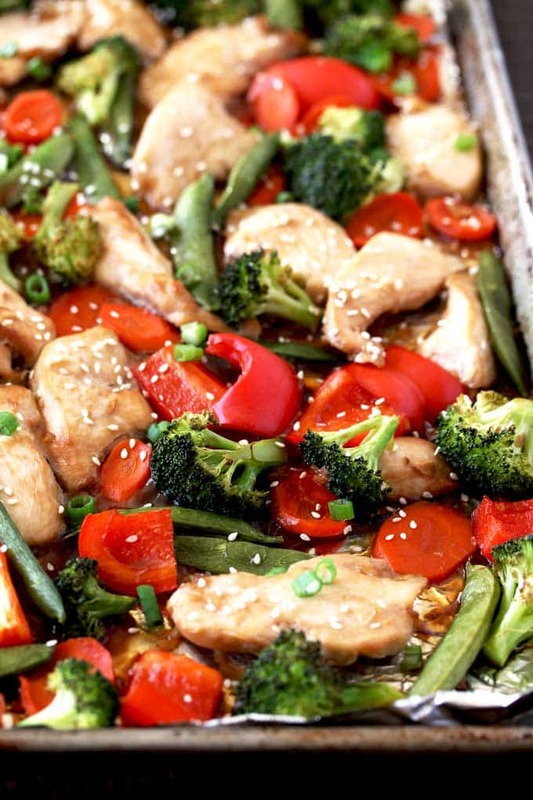 I will definitely be saving this as one of my go-to quick and delicious meals! Also, I have a big 15 inch skillet and was able to fit 8 thighs in one batch. I’m glad you loved these! We make them all the time too! I made this twice last month & had to search for it to make it again tonight. I’ll save it this time! 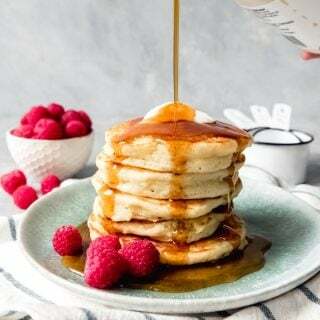 Wonderful dish! P.S. I too love my camera, travel, my husband & 4 kiddos (ages 10-15), & cooking (less than the others) – & am a SAHM/previous doctor (OB/GYN). I love that we have so much in common! 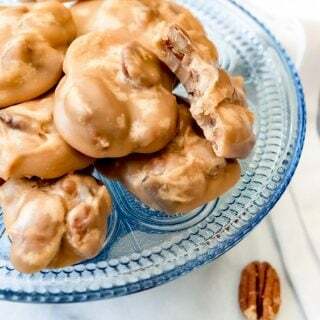 And that you were able to find this recipe again! It’s a favorite in our family as well. Once you flip these on the stovetop do you immediately put in oven or keep it on stovetop for a while? Wanted to make sure I’m not missing that. Splatter guard is a must….. I made an amazing mess!! I know what i’ll be doing tomorrow, cleaning the oven…. As for the chicken!!! It was worth it!! Fantastic…Crispy and Juicy. This is my favorite go to for Crispy thighs and these taste as good or better than fried. Pop’s came over for dinner last week and I made these with the stir fried Bok Choy and it was a hit. I now added this to my Keto rotation. The only changes I made was I seasoned the chicken with Spice Caves Paleo seasonings Wind and Land. And I doubled the Boy Choy and used coconut aminos. So good! 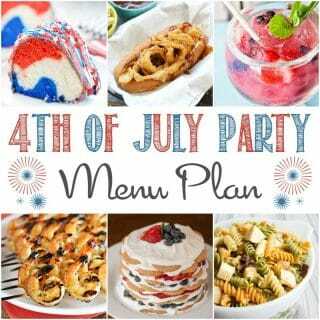 I switched it up and made it with legs my kids absolutely loved it!! I cooked it just a little longer on the stove. Best chicken ever 3 simple ingredients. 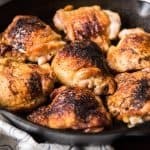 My go to recipe for chicken thighs. Great crispiness, good flavor and simple to prepare. This recipe is great when you have an entire day to read the novel sized preface. Its superb images showing the the chickens maillard reaction draw you in to prove once again, that a picture is worth a thousand words. The printable version says medium heat for the pan, the text says medium-high. I’m guessing medium-high is the correct setting. Yes, it’s medium-high. Thanks for noticing that!